The USS DUBUQUE (LPD-8), an Austin class amphibious transport dock, was commissioned on 1 SEP 1967. USS DUBUQUE, named for the city of Dubuque, Iowa, was built at Ingalls Shipbuilding in Pascagoula, Miss. After commisioning and shake down in Hampton Roads, VA, DUBUQUE sailed for her homeport of San Diego, CA via the Panama Canal. Joining the Pacific "Gator" Force at the height of the Vietnamese War, DUBUQUE made a series of "West PACs" that sailed into Vietnamese waters. Continuing with Western Pacific deployments after the war, DUBUQUE was forward based when her homeport was shifted to Sasebo, Japan in 1985. 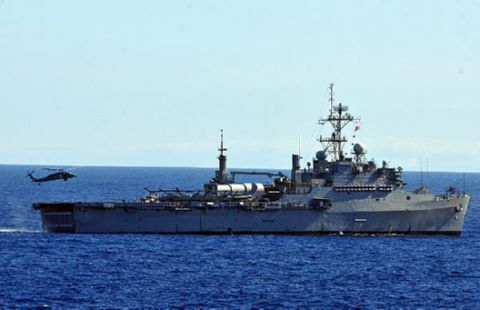 The late 1980s and 1990s called DUBUQUE to the Indian Ocean and Persian Gulf repeatedly. Shifting homeport to San Diego, CA in 1999, DUBUQUE continues her career of West PACS, humanitarian aid and contingency deployments as needed. USS DUBUQUE is known as "The Toughest Gator Going".